Sir Lionel was mentioned in a blog in 2007 to be found quite a long way below. At the 2008 Carden Gathering my nephew Matthew Carden gave a lecture about Lionel's adventurous career which included recruiting General Millen of the IRA as an informer regarding the bomb plots in the late 1890s. See the report on the Gathering. 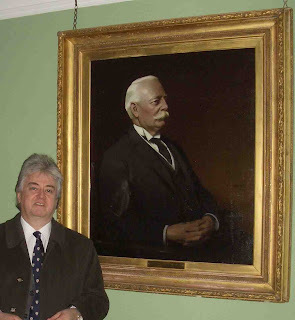 My son Mark recently saw this portrait of Sir Lionel in the dining room of Pratt's House at Eton College, where one of his godsons, James Richardson, is at school. The latter's father, Phil Richardson, kindly drew it to Mark's attention. The portrait is signed H.J.Thaddeus 1912, so it is interesting that it was made at about the time he received his KCMG awarded for his services in Guatemala, just before he returned to Mexico where his policies infuriated President Woodrow Wilson. Mark appears in the picture.